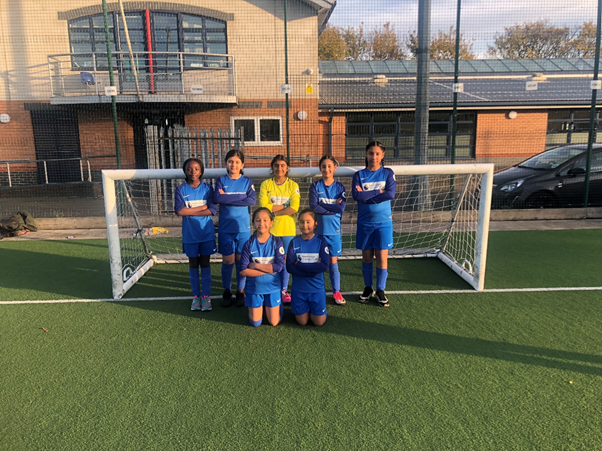 Twelve girls from Year 3 and 4 visited West Acton Primary School to play in a football tournament. The children had a very enjoyable experience and represented the school extremely well. They even managed to win an award for the amount of respect they showed each other, their teachers, the other teams and the referee. Well done girls! Once I got to school, I went and received the brand new kit [Nike]for football tournaments and I was standing out of my team because I was wearing a yellow kit (goalkeeper kit) but the others were wearing blue coloured kit. After, we arrived at Featherstone High School and one by one schools started arriving. Then the leader of the football tournament came called every school to come through the door and into the football pitch. I was amazed by the size of that football pitch. We started to play against a school and it started with 0-0 then I failed to save a goal and the score ended up to 0-1. The rest of the morning involved a lot of hard fought battles but in our last game of the morning Umar scored a free kick at the end of the game to give us 1-0 win! It was a tough morning but the afternoon was much better. We ate our lunch after about 5 matches and we were split into four groups A,B,C and D . Then we played North Primary and we won that match by one nil. The day had been fun but even though we didn’t win we did improve as a team. I enjoyed and so did my friends. Our first football tournament for the year 3/4 team was great! We went to Goals at Wembley and we played against 3 schools. In our first match luckily we won 1-0. Next, we put on blue and white face paint and it represented our school. After that, we played another team and they were pretty good but we still managed to beat them and the score was 2-0. A mascot came along and was cheering us on, we felt really supported so that’s how we won the match. Then we headed straight to another match and they were really rough and we lost 0-1 and our team tried so much but we lost. Then we went to the building so they can tell us that who were the runners up and the people who won the third place. The team that we lost to won the medals and the trophy. We were 2nd on our pitch and they gave us tickets for the QPR ladies vs West Ham ladies and a certificate in return. We tried our best, we used our team work and we had a great time. On the 18 January we had a Girls Football Tournament at Featherstone High School. In the morning our team had struggled facing some tough teams but we managed to draw some and unfortunately lose some. When we had got into the afternoon our team did great and won some matches. We had listened to Mr Coakley and Miss Afzal. They helped us get through all of the teams and were supporting us from the side line. The girls on the team supported each other while on the pitch. Mr Coakley was fair to our personal opinions in which position we all wanted to play in. He was fair to all us girls and switched us out to let others play. The girls would not get upset when the other team scored a goal we would just keep trying .It was a great afternoon and we improved all our skills and team work. At the A-Team football tournament we were put in an extremely hard group. Despite that, we tried our best as a team and managed to win a few games and lose a couple. We worked together as a team and got through some difficult situations throughout the tournament. After a few games, all the teams were put into separate groups based on our performances from the previous games. After the adults announced which groups we were we then went to a different side of the Spike Bridge’s football pitch to compete against teams of a similar level. Some of my team mates told me they were scared of the other teams but I told them to keep their heads up and that’s exactly what they did. We had to wait one or two games before our one started. When our game started our two teachers (Mr Coakley and Mr Moraga) shouted for encouragement. Amazingly, our team won every single game that we played! The A-Team was extremely proud and so were our supporting teachers. We came first in our group and it was an amazing thing to achieve. After winning all the games as a team we felt over the moon. It was a great thing to accomplish and an amazing honour being chosen to represent Tudor Primary School. On Friday the 15th December 2017 Tudor Primary School attended the football tournament at Berymede (Acton). 2 teams played head to head with 4 other schools in 10 games, which were hard fought. Everyone played well and deserved a big reward. Everyone enjoyed the tournament in addition to the training in the morning.